It has been long assumed that the majority of amyotrophic lateral sclerosis (ALS) cases occur sporadically, while only 5 to 10 percent are defined as genetic, in which ALS is inherited via a straightforward autosomal-dominant mechanism. However, researchers at the Penn State Hershey ALS Clinic and Research Center, working in collaboration with the Institute for Personalized Medicine at Penn State Hershey Medical Center, have now found that more cases occur as the result of extremely complex genetic factors than previously thought. Researchers have helped determine that many cases appear to be recessively inherited, which would account for the fact that there is no identifiable history elsewhere in close relatives. 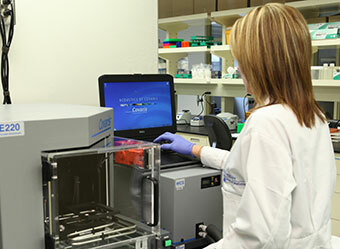 A technician prepares genomic DNA samples for subsequent sequence determination. The Covaris uses sound waves to fragment genomic DNA into small pieces suitable for sequencing. Penn State Hershey scientists collect DNA specimens from their available pool of ALS patients. 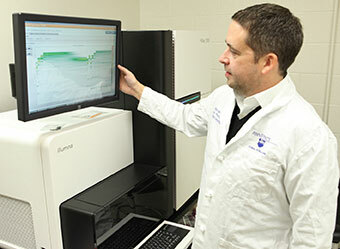 As one of only 41 ALS centers nationwide with the Certified Center of Excellence designation from the ALS Association, Penn State Hershey clinicians care for more than 80 new patients with ALS annually, and work in collaboration with other centers to examine the DNA sequencing for those patients to determine the genetics of the condition. Zachary Simmons, M.D., director, Neuromuscular Program and ALS Center, states: “Our internal DNA sequencing has permitted us to identify some genes that are potentially causative in ALS, and we continue to move forward to confirm those findings.” A forthcoming partnership with the New York Genome Center aims to further the understanding of the genetic basis of ALS, with the details of the data-sharing process to be finalized over the remainder of the year. FELLOWSHIP: Neuromuscular Diseases, University of Michigan Health System, Ann Arbor, Mich.
MEDICAL SCHOOL: University of Florida College of Medicine, Gainesville, Fla.
Peters OM, Ghasemi M, Brown RH Jr. Emerging mechanisms of molecular pathology in ALS. J Clin Invest. 2015 May 1;125(5):1767-79.